Take advantage of a reliable service in Townfield that has earned over 95% of positive feedback! Q: How is your window cleaning Townfield going to restore the clarity of my windows? In-house window cleaning – The experts will scrub dirt with ladders and squeegees. A: If you spot gloomy clouds on the day of your session, don't be upset. The window cleaners in Townfield can still perform the service as long as they're facing a light shower. However, in the event of a rainstorm, we will kindly ask you to put off your appointment to avoid any injuries. A: Yes, you can! The cleaning team will need a empty parking space in close proximity to your building (30 metres or less) and on the same side of your panes. Q: Do I need to meet up with the specialists in person? A: It's no problem for the cleaners to rinse the outer surfaces of your windows as long as they are free to enter through your front gates. And if smears have landed on your interior surfaces as well, just inform us and we'll perform a free key pick-up and delivery. A: Yes we're licensed to clean any type of pane or window part. What's more, every PVC or UPVC frame or ledge will be treated at no extra cost! When you schedule a window cleaning Townfield session, you'll be able to refresh the casements of any property at affordable rates that remain unaffected by minimum contracts or hidden payments. See if you agree with our statement – stop by our user-friendly price table below. Based on your needs, our window cleaning Townfield can offer you with three options. If you opt for exterior cleaning, the experts will utilize a special water-fed pole. 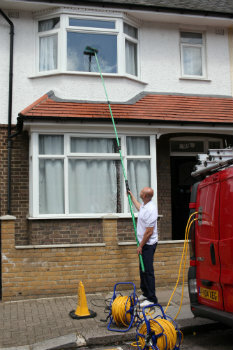 This cleaning tool can stretch up to 22 metres in length, which is equivalent to the height of a four-storey premises. The Townfield window cleaners will use purified water under high pressure that will wash away all grime in almost an instant. If you have a multistorey property instead, then go for our rope access window cleaning. There, a team of licensed climbers will methodically polish your windows until they witness the reflection of the setting sun. For your ease of mind, we inspect the washing equipment on a frequent basis and can provide COSHH records at your request. As our client base broadened, we widened our window cleaning in Townfield to encompass other London areas as well. Please consult with our short list to learn which close by locations we cover. For those of you who'd rather book window cleaning services Townfield UB2 online, fill in our get a free instant quote form.